I also remember (more clearly) last year when Cyclone Yasi (or was that Larry?) wiped out the North Queensland banana crop, driving banana prices up to $15 a kilo. Almost overnight, bananas disappeared from our fruit bowl. I allowed myself one per week as a special treat – almost a guilty pleasure. Everyone was talking about bananas. Lusting after bananas. Lining up at the juice bar for a banana smoothie became akin to ordering an exclusive cocktail. The horror didn’t last too long; as the next banana crop reached market, prices fell back to normal levels below $2 a kilo. And I fell back to taking bananas for granted. This morning I spied two over-ripe bananas languishing amongst the apples, oranges and nectarines in our fruit bowl. That would never have happened at $15 a kilo! I deplore food waste and here it was happening in my own fruit bowl, all because a price signal was no longer there to remind me of the value of food. I resolved (again) to waste less food. Some researchers estimate Australians send to landfill some 30% of the food they purchase. Yikes! Definitely not good enough. Deciding to drag matters back under control, I whipped those two over-ripe ‘nanas into a batch of muffins using a recipe I googled over here. My three fifty-something sisters will laugh (cackle, guffaw, perhaps even pee a little) to see me featuring home cooking on my blog. I was definitely at the end of the helix when they were handing out culinary genes in my family. My oldest sister K was front-of-line. 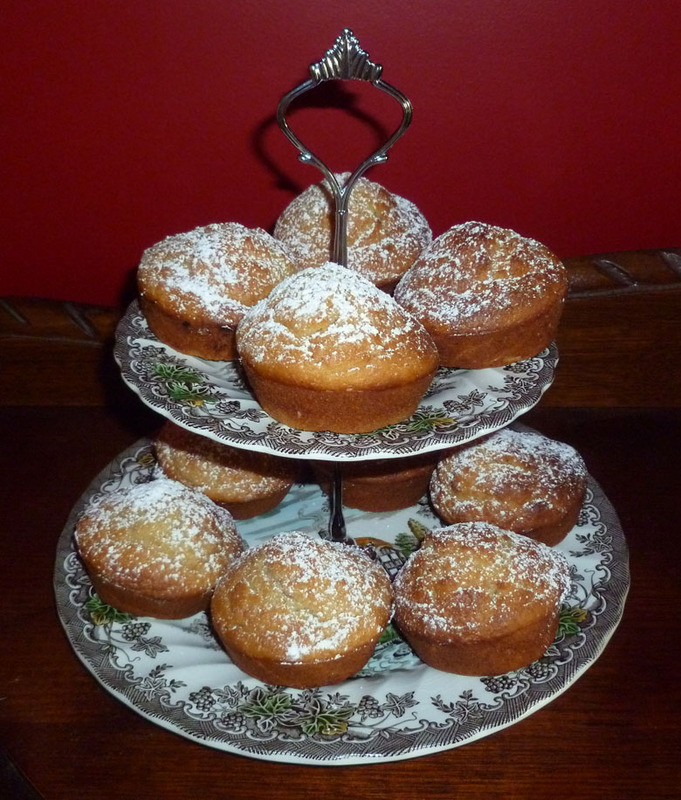 My muffins aren’t perfect, but they’ve elevated me above food-wasterer for today, at least. These little beauties are destined to be lunch-box treats for the men-of-the-house but I’ve photographed them on this pretty display plate to segue to an otherwise unrelated story (something a little more up my alley). This gorgeous two-tiered plate combines some of my favourite things: vintage transferware, poetry and family provenance. The Myott plates were part of my husband’s late Granny Cherry’s collection. I’ve had them for many years, hidden away while I hoped to luck across a suitable metal fitting on my travels. I never did. Recently, while on a declutter spree, they re-surfaced. I checked eBay and found a seller in the UK listing the correct-sized fitting for just a few dollars. In just a few days it arrived and I had a fancy two-tiered display plate befitting high tea at the Ritz. 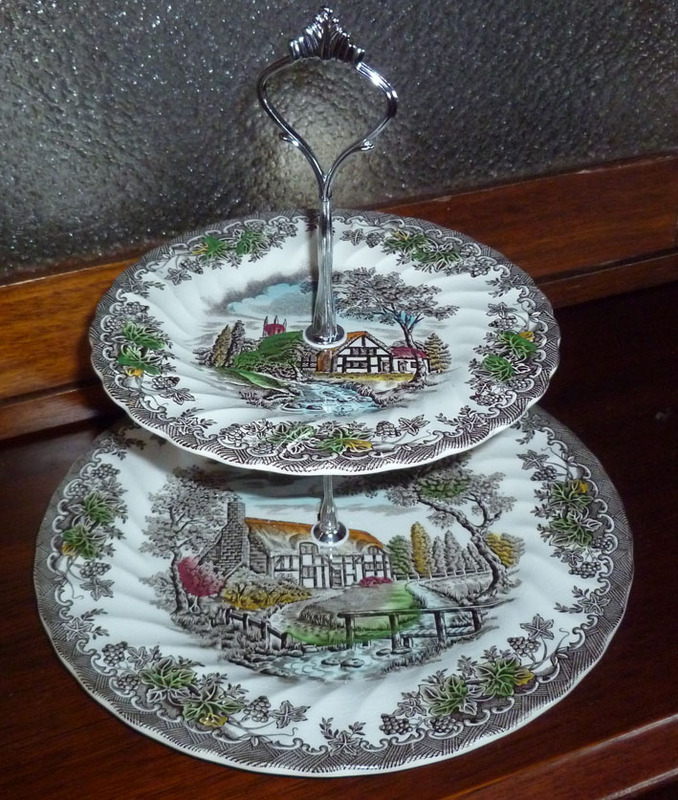 The plate design features a cottage scene and on the base, each has a stanza from the Tennyson poem, “The Brook” – very much a favourite of mine. Unfortunately, unlike brooks, bananas do not go on for ever.